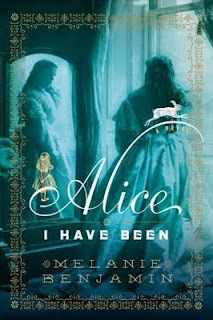 Thanks to the genorosity of Random House, I have 1 copy of the FABULOUS new book Alice, I Have Been by the talented Melanie Benjamin up for grabs! I can not begin to tell you how much I LOVED and ADORED this novel! There is not one thing I would change about it. My review will be a part of Melanie's book tour and will be posted on the 19th, so stay tuned! Giveaway is open to US and Canada entries only and ends on January 29th. Oh yay, What a great giveaway! I would love to win this, Amy! Please enter me. Yes, yes, yes! Please enter me! This sounds wonderful; I remember seeing all the photos of the original Alice at the Morgan Library some years ago. I would like to enter as well. Thanks for hosting the contest! A friend of mine raves about this; I've wanted to read it ever since she told me about it. Please enter me also Amy!! Please enter me - I've been hearing great things about it! Please enter me to win Alice I Have Been. It looks amazing! This book is on top of my Wish List for this year. Thanks for the chance to win a copy! Please count me in. I almost bought this book the other day. It looks so good. But I promised myself not to buy any more books until I read all the ones on my TBR pile. Thanks for the chance to win this. I would love to win a copy of this book. It has been on my radar for awhile. This one is one my wishlist! Sign me up! Please enter me in this giveaway. Sounds like a wonderful book. Thanks for hosting the contest. I can't wait to read this one after all the buzz I've seen. Looking forward to your review! Please enter me! Sounds interesting. Please enter me to win. This book looks/sounds/reads great. I would love to be the lucky one to win it!! DYING to read this one!!!!! What a great contest! I just saw this on facebook and goodreads! Please enter me in the giveaway! Please enter me! I'd love to read this. All of my bookseller friends have been RAVING about this book - please enter me! I really want to read this book, can you tell? I'm fascinated by the synopsis. Please enter me in the giveaway. There are so many great books coming out this month that you have shared with us. This one sounds great and one that I definitely want to read. Please enter me in the giveaway. Thanks. I cannot wait for this book to come out! I totally want to read it, enter me please! This sounds like a touching story of a woman of strength who lives a rich life. I didn't realize the story of Alice in Wonderland was patterned after a real person. Will be interesting to see how this effected her life. I requested our library director order it today. I can think of several patrons who will enjoy it. This sounds like a very interesting book! Sign me up! I have read some positive reaviews about this book so would like to enter. This sounds like such a great read, I would like to enter this contest! This sounds really interesting! Please enter me - thanks! I want to read this one so bad. Please enter me! I'm hearing such raves for this book! Would love to read it! Hi...I'm a new follower and delighted to find your blog. I love historical fiction and would love to be entered in your giveaway for this book. Thank you! This does look great and wondeful. I can't wait to read your review for this. What a great giveaway. I;'excited for this book! Thanks for the giveaway! This book is getting lots of attention. I'd love to read it. Thanks. Thank you I would love to read this book! This book sounds fabulous. I am very much intrigued and would love to read it. This book sounds totally awesome. Oh please enter me I really want to read this book I love alice in wonder land. shes just a great character. This sounds wonderful. I recently saw a film about Alice. Please enter me in your giveaway. I would love to win this book. My book club is reading Alice in Wonderland this month. This sounds like a great book and I'd love a chance to win it. This sounds like a great book - and the timing with the Alice movie w/Johnny Depp is excellent as well! I didn't realize until I had read another review that Alice was based on a real girl. I would love to read this book. Seeing this one everywhere.. and I can't resist. Call me gluttonous. I love everything to do with Alice in Wonderland. The Disney version was a favorite when I was a child...still is, actually! I'd love to win; this book is very high on my wishlist. I've always been crazy about Wonderland. There isn't any book I've read quite so many times besides it. I'd love a chance to read this! Please count me in--I am dying to read this book. I would love to win this! It sounds really good! This book is on my TBR/wishlist. Would love to win it! Will read it, regardless. Thank you. since you gave it such a great review, you better enter me! Oh no! I can't remember if I requested to be entered or not. Well, if not, please enter me! This is a must have at the top of my wishlist. Please enter me and Thank You. I'm thrilled the reviews are so positive, because it sounded like such a great premise. Put my name in please. I would love to read it. Oops! Forgot to post my email with my last comment! If it's still OK to enter the drawing, I'd love to win this one. Thanks so much! This looks like a great read - please count me in! I would love to win this book. I have tried to get on the waiting list at the library for it, but alas, they don't have it yet.